Toddlers are snacking machines. Having raised three toddlers now, I figure that equates to approximately 1,450, 346 snacks that I've dished out. As a parent I've realized that snacking just comes with the territory. So I roll with it, and I've been known a time or two to sneak a bite of their snack myself. The hard part is keeping all that constant snacking healthy. We are always on the go, whether at home or traveling, and while it can be easy to just grab whatever, I've realized we all feel our best when we follow healthier snacking routines. Toddler snacking was a recent conversation in my mommy group. One mom noticed the Happy Tot Whole Milk Yogurt Pouches I was feeding the girls on the sidelines of the playground, and asked me about them. She was stunned to see they were pouches of yogurt. Most of the mommies in my group had never seen yogurt available in a pouch before and were so excited. Because as toddler snacking pros we all know anything that can come in pouch form is just plain awesome. As the conversation progressed, we all chatted about our snacking little machines and what their favorite snacks were. One common theme amongst us all was how difficult it seemed for us all to find healthy snacks that were easy to pack on the go, and were ones that the toddlers actually wanted to eat. 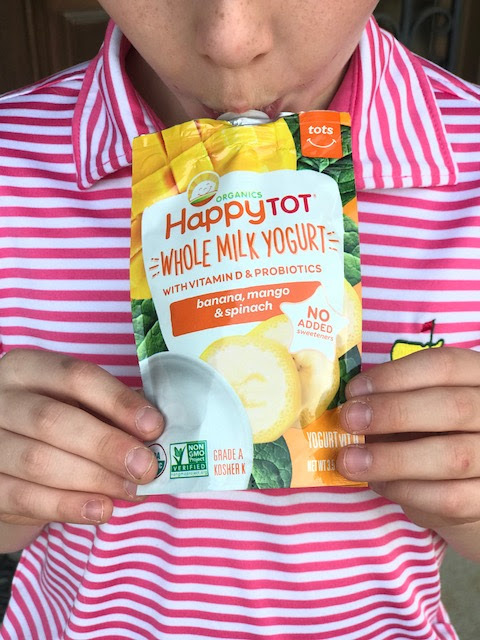 I was already winning by introducing Happy Tot Whole Milk Yogurt Pouches to the mix. They are USDA Organic certified, and are made without any added sweeteners. Because - let's be honest - the less sweetener in a toddler's diet the better (particularly my high energy bunch). I stumbled upon them in the refrigerated sections of our Publix (click here to see if they are available at your local grocery store retailer), and now it's one of the most requested snacks to pack from the girls. Balance - You know to eat a well balanced diet when it comes to meals. The same mentality should apply to snacks. Instead of always grabbing the same crackers or the same puff cereal, try to make sure you pack a variety of options. Portion Control - Eating too much of a good thing...well, that can lead to bad things. Even if you are offering your toddler healthier snacking options, make sure they are being offering eating portions appropriate for their tiny size. This is an easy way to ensure your toddler is eating the correct amounts as well as not interfering with next meal. Timing - Timing is everything, even when it comes to toddler snacking. Timing snacks accurately helps establish great eating habits beyond the toddler years. A good rule of thumb seems to be getting toddlers to eat every two to three hours, and timing snack time to land somewhere between each larger meals. The more structured snack routines will help toddlers self regulate with food as they get older. Avoid Snack Rewards - This by far was the most controversial tip amidst our conversation. I am so guilty of using snacks as a reward for good behavior or a bribe to get The Cutes to do something I need them to do. Many moms stated this was a bad practice and emphasized using stickers or something else would be better in the long run. Unless you reward with vegetables. If broccoli is a coveted rewards snack in your house, then by all means continue on! Present Healthy Options - It's no secret that toddlers like choices. When on the go or at the house, when snack time occurs, present your toddlers with a few different options. Dictate what kind of snacks will get packed, but then let them decide what they want from the snack bag. This helps the toddlers express their need for independence and lay the ground work for healthier eating habits later in life. Such great tips and so easy to incorporate into our daily routines's without too much extra effort, money or time. I love when moms come together to share great advice. Even the third time around I learn so many amazing to tips and techniques to wade my way through this little life we call motherhood. What are some tips and tricks you have for getting toddlers to establish healthier snacking habits? Do they have a favorite snack? Share with us!